Another excellent post, Kevin. Please keep up your great work - you are providing a fantastic public service with your analysis. Why would you have a Scottish commission of Scottish experts to plan for a Scottish currency and not include Scotland's leading expert in currency matters on it? Because that expert, Prof. Ronald MacDonald, awkwardly points out how the enormous cost of setting up a new currency. 1. The economic arguments for independence are now very weak but also there is the no small issue that the electorate are much more 'educated' on the arguments following the last referendum. You mention set up costs - these are always higher than estimates and will take longer than planned. Scotland probably simply does not have the skill sets in many areas I suspect. 3. The interim currency post independence is, in my view, a key question for the electorate and cannot be fudged - Sterlingisation is a non starter. 4. 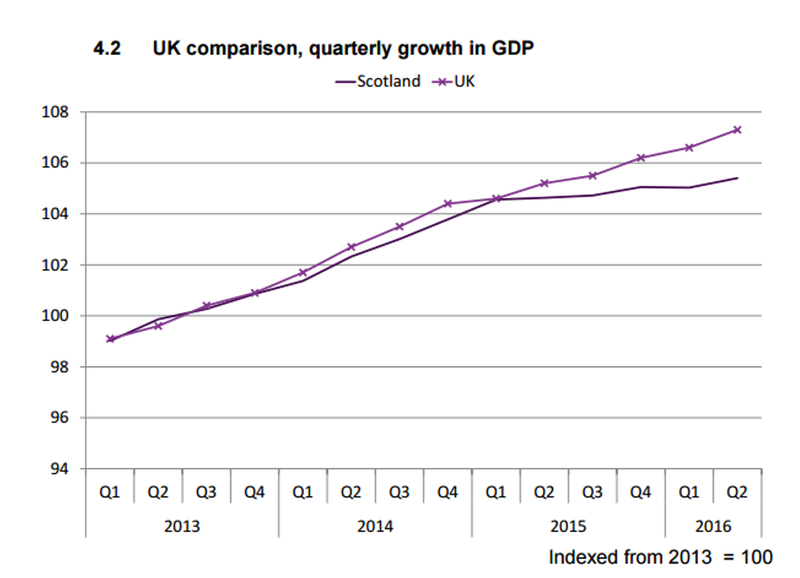 As time goes on the Scottish gov and economic performance looks worse and worse so the - 'we are good at running things - trust us' looks increasingly unconvincing. 5. The polls show little or no movement towards a Yes and strong dislike of having another referendum anyway. This is whilst there is no serious counter activity to the SNP. Can you imagine what a really professionally run No campaign would do to public opinion? I think the FM knows all this, knows she cannot actually have another referendum and win. I fear they don't actually know what to do because going down the current route leads inevitably to pushing the Referendum button or definitively saying we are not going to. Either way the SNP lose. I think the FM is suffering really serious stress looking at her body language now. I've been saying for a while now that Sturgeon has quite literally painted herself into a corner. She thought she was being smart when all she's really done is show how inept she really is. She should have joined a council when younger and maybe, just maybe got a managerial job not too difficult for her. She's way way out of her depth in Government and so are most of her ministers. Nicola Sturgeon is fixated on being a member of the EU as she knows her SNP have no idea on how to run an Independent Scotland in the world. She knows she would have to rely on the EU to negotiate trade deals and Scotland have no trade negotiators. That is also why Scotland is not likely to get much say on Brexit as she would be a spy for the EU. I have also noted for many years the SNP's exclusion of the few Scots with real political and business experience with the EU and the World. There is also no evidence at all that the SNP have any innovative thoughts on how to run Scotland's economy, our NHS, our Justice system or our Education system. Kevin's excellent post here shows just how lacking we are in Scots with real knowledge being represented in critical posts in government committee's. Perhaps we should try and list Scots that could contribute real vision and experience... I vote to include Dr. James Wilkie and David Thomson. and of course Kevin would be on this list as well. Anyone else we should follow? Another very comprehensive blog, Kev. Shame few Nats will read it, and most journalists won't challenge them on these important issues. One area that would surely be affected by independence is personal debts, but I've seen nothing mentioned about this in a Scottish context. If we were to go indy (god forbid) it's increasingly clear we would need a new currency. Lots of people in Scotland have debts in sterling, eg mortgage debts, credit cards etc.... I can't see the companies to whom the debts are owed being willing to swap a Scottish-based customer's debt from sterling to the new Scottish currency (why would they? ), so a large number of people will still have debts in sterling that have to be re-paid in sterling. Now, imagine a scenario where the new Scottish currency devalues against sterling (not unlikely, I'm sure you'd agree); the effect of this would be to increase all the sterling debts. 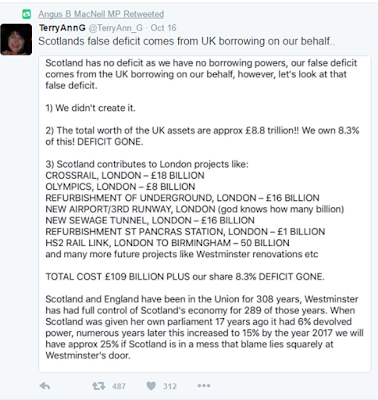 I think if the Scottish currency devalues by 50% then the size of anyone's sterling debt would effectively double, if my maths is correct. Not saying it would devalue by 50%, but it is a useful example. Have I got this correct, and if so why isn't this something people are being made aware of? In my experience people are happy to ignore economic realities at a government level, but when they are faced with the prospect of having their own costs increased they become much more focused on what's being proposed. Excellent as always I have to say. Great comment, but I believe that management would have been beyond her: she lacks the empathy and the conciliatory skills and the pleasantness needed to rise in a normal organisation. She would have ended up being a junior solicitor in a local authority somewhere, getting paid 30 grand a year, and would have been stuck there for life. And that would have been her. Alas, the Scottish Parliament came along, and catapulted her as well as scores of others into positions and salaries that are vastly beyond what they could ever hoped to have achieved out in civvy street. This has been a real black mark on Scotland, as it has amply demonstrated that our education system and our electorate are simply not up to coming up with 188 top quality MSPs/MPs. The starting point to fixing this is to cut all salaries for MSPs and ministers in half, cut the number of MSPs in half, and try to ease Holyrood out of existence. But the chances of this happening are precisely zero: those 129 MSPs have their snouts firmly in the trough, and they will stay there, on ever-increasing salaries, until hell freezes over. This is an incredibly important point which was hardly touched on last time out. But at least it provides a fresh avenue for attack for the No side next time, eg: "YOUR MORTGAGE IN STERLING? PREPARE TO BE HAMMERED"
I totally agree wrpt the comment on non Scottish currency denominated debts. When raised in a campaign would actually force a lot of people to focus very greatly on the currency issue due to their horrendous personal exposure. Prior to the last referendum I asked someone in the field how do you assess the pension liabilities. The answer was - no one has even begun to think about it. The inherited liabilities in the public sector could be extreme and the legal obligations to pay in Sterling ruinous on a fragile Scottish currency. Note unraveling the liabilities for those who have moved between rUK and iScot would be absolutely horrendous take years and create a huge degree of uncertainty. Since the state pension and public sector pensions are essentially Ponzi schemes (people paying in now are the revenue stream for pensioners) the burden on the Scottish taxpayer in a devalued currency doesn't bear thinking about. Part 1 Its good to see you and your chums are pleased with your latest outpourings. I have to say I was disappointed. You make the claim that "It seems Sturgeon has decided to harness up the nationalist troika to three wildly incompatible horses." and then set about trying to demonstrate this. Lets take it section by section shall we? First Andrew's Wilson's Commission (do you really think the ""Acceptable Face of Capitalism" bit was necessary? Bit dated? No?) is held up to scorn on basically two points. First we are told its members are all Nats, or supporters or fellow travellers. Well blow me down! Perhaps you could tell me about a Commission, appointed by a party that included those with a problem about the main aim of that party? Or at the very least with a fixed majority (eg the Smith Commission's inbuilt Unionist majority) supporting that aim. Secondly Scotland would lose what is currently a £9bn annual fiscal transfer from the rest of the UK. Ah yes, you mean that more is spent in Scotland pc than elsewhere in the UK, leaving aside spending not attributed to any region. 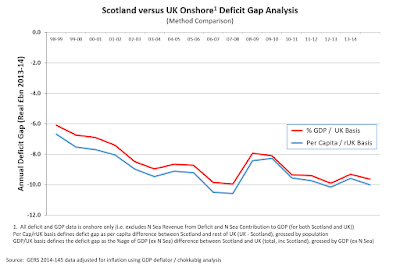 But while it might not have been true for the last couple of years, is it not a fact that since 1980 Scotland has delivered more – in some estimates much more – in the way of tax revenues (even estimated by GERS - and yes I am one of those who disputes the accuracy of GERS, but then GERS does that as well) than rUK? Your point about a “fiscal transfer” is an interesting use of words for money spent by govt has to be money raised by govt and in that regard Scotland in the last 35 years has done more than its share. I wonder why tax raised is not mentioned. It is fair to say Kev that if you define the data, you are half way to achieving the statistical outcome you want. Secondly George Kerevan. I found this section interesting for its utter hypocrisy. One of the incessant charges of the Unionist side (ie your side) is that Nats are all robots - we say the same things and think the same thoughts. So, let’s give George a good kicking for not sticking to the party line. Isn’t that the job of the SNP? Yet having got him elected as an MP they can hardly complain they didnae ken. Can they? Even a cursory reading of his columns in the Hootsmon - till he got too off message for them - demonstrates that none of what he is saying now can surprise anyone. So, which is it Kev? Party of drones? Or a broad church? If his ideas have no support, how did he get elected? You might also want to note that there is only one MP among the membership of 14 – Roger Mullin, the Finance Spokesman – while Kerevan might be kept busy by his membership of the Treasury Committee. Don’t you think? Lastly the panto horse. There is so much in there - and God knows you might even be right on one or two instances (after all, even a stopped clock is right twice a day) - but let’s take the one about Dunleavy. Assuming the reader can be bothered to follow up the link (because having condemned his opinion about set up costs, you can’t be bothered to repeat, or even summarise why), the first quote at the other end of the link is this ""The Institute for Government (IfG) and the London School of Economics (LSE) have published independent analysis which puts the average cost of setting up a new policy department at £15 million. Applying this to the 180 departments the Scottish government states it would need could see Scottish taxpayers fork out £2.7bn" THAT is the quote that had Dunleavy reaching for his phone to excoriate some poor wee Treasury drone for misusing his work. You go on to claim (I am still in the earlier blog about Dunleavy) that "It's clear to any objective reader of the report that the Prof has chosen his side" Is it really? Dunleavy is after all a Prof at LSE, and a career academic with, to the best of my knowledge, no connections with Scotland far less the SNP. I have no knowledge of his opinion before or since 2014 about our independence. You say yourself he had reason to be pissed off with the Treasury's use of his report (for that well-known Nat rag the Sunday Post) but "It's clear to any objective reader of the report that the Prof has chosen his side" according to Kevin Hague. Well that is some conclusion for someone who, to the best of my knowledge has no experience of academia. If you imagine that someone like Dunleavy - a career academic, in a world class institution, and nearing retirement - is going to put his reputation on the line for a political party then you will believe anything (mind you, your belief about GERS is not a good start!). Lastly, and reverting to some of your earlier comments, I am increasingly perplexed by an increasing Unionist tendency to be rude. I am not concerned about casual rudeness (you might find some of what I have said to be rude at times - indeed you might find the very fact I am writing this rude) but that there seems to be a strategy of rudeness, that if you cant kill the message, you kill the messenger. Your approach to Andrew Wilson is one instance. Your reference to another Commission member that she "was a proud champion of the discredited SNP front "Business for Scotland" (and holds some pretty "out there" views on hidden oil fields), but we'll let that pass3." - very decent of you, but the point is still made. So how about this - that BP is selling up in the North Sea to explore west of Shetland! Have a keek at this http://www.bp.com/en/global/corporate/press/press-releases/bp-starts-seven-year-west-of-shetland-drilling-programme.html - or is BP "out there" as well? Would the value of any new/interim currency against the £ not be very significant when it came to Scotland paying back debt and paying set up and transition costs? Many British companies based in London own land, property and investment portfolios in Scotland or have a substancial customer base in Scotland. The Scottish and English economies are so intertwined it would take years for them to become fully separated if Scotland became independent. Scotland is a net importer of goods and services from the rest of the UK which means billions of pounds worth of small and medium sized businesses in the rest of the UK rely on Scotland for trade. Realpolitik suggests that it would equally be in everyone's own self interest that Scotland had a stable currency and economy if it was independent. There are 400,000 people living in Scotland currently born elsewhere in the UK. The majority of them will have mortagages and pension investments too. Even if they wanted to, they couldn't all sell up at once and leave Scotland if it became independent. Many powerful and well connected people in the UK own land and property in Scotland too. Samantha Cameron’s stepfather, William Astor, the 4th Viscount Astor owns the Tarbert Estate in Jura. The editor of the Daily Mail, Paul Dacre, owns the Langwell estate, a 20,000-acre area near Ullapool. Gerald Grosvenor, Duke of Westminster Prince William’s godfather and the UK’s biggest landowner owns 94,817 acres in Scotland including the Reay Forest Estate in Sutherland. The Queen owns privately Balmoral part of 61,507 acres in Scotland. The MOD is one of the biggest land owners in Scotland, owning a landmass area equivalent to 8 times the size of Glasgow. 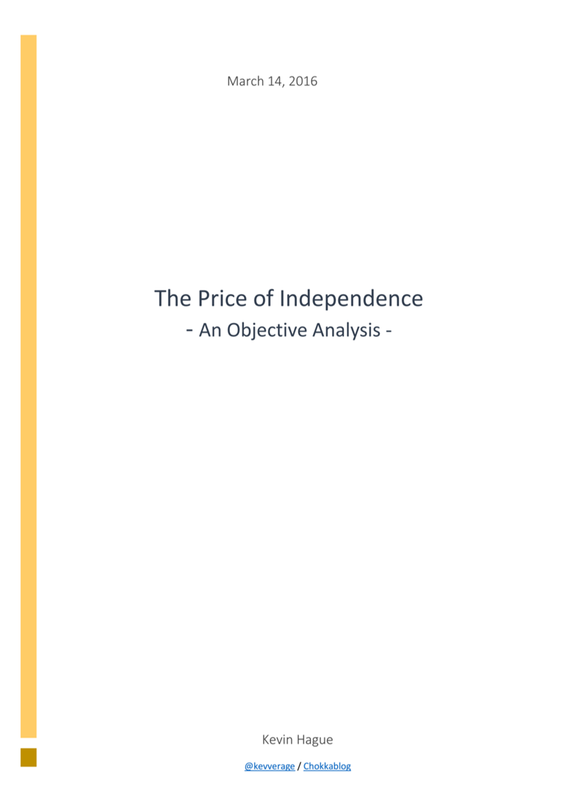 Any collapse in the value of pensions and mortgages leading to a collapse in the value of land and property prices in an independent Scotland would have a knock on effect not just here but it could spread further afield. In 2010 the UK Government gave the Republic of Ireland a direct bilateral loan amounting to around £7 billion over and above the UK's contribution to the bail out of countries in the Eurozone. This wasn't for sentimental reasons but because it was in the UK's interests to see Ireland stabalise, as a major trading partner with a banking sector closely linked to the UK's. I recall Kerevan's columns for the Scotsman from years back. Then, he took a broadly centrist approach to economics, such that he once complained about Tommy Sheridan calling him a member of the Thatcherite wing of the SNP. I wonder what changed for him to go back to a very left wing economic position? Also, why does he sometimes say things that suggest a certain awareness of the problems of Scottish independence? I'm not holding the Growth Commission up to scorn, i merely observe the make-up of it and highlight the scale of the challenge. "acceptable face of capitalism" i'm happy with as a set-up against Kerevan's polar opposite position - it's hardly a term of abuse. On the *political* balance of the commission I make the point that the Greens aren't on there - is that such a naive observation? and the relative weight of politicians/academic to business people. I don't offer any damning judgement, I just point it out. "why tax raised is never mentioned" - what on earth do you think it is that the growth commission is tasked with growing? If you're argument is that the lengthy post doesn't spend enough time raking over old ground, this blog is full of analysis about tax revenues (for example here and here) and I suggest you read them. Your confusion is maybe about the difference between the past (when we were often net contributors because of oil, no question) and the future (which I'm afraid is all we or the growth commission can influence. As for you thinking my summarising Kerevan's ramblings is "hypocrisy", I'm afraid I'm at a loss to follow your argument. I'm not giving hi "a good kicking" for not sticking to the party line - I'm pointing out that what he proposes is an economic strategy that I (and I'll wager the Growth Commission) consider naive and dangerous. Pointing out that he's playing to a particular gallery is hardly controversial, is it? you criticise me for not summarising Dunleavy's arguments - despite the fact that I link to a full blog post where I have done exactly that in intricate detail. Again, if you think this blog post wasn't long enough or well enough cross-referenced you might find you're in a small minority. I say about Andrew that he is "by all accounts a decent and intelligent chap" and that the commission includes "two active Scottish businesswomen with real entrepreneurial credibility" - I'm sorry you find that so rude. You seem to find the fact that I highlight what people have actually said as being rude - I can't help you there. As for the BP link: 1/ the reference I made was to claims of oil fields in the Clyde and 2/ Great, maybe the growth commission will be able to produce a one word report that just says "oil"
Another great piece of analysis. Thank you, Kevin. "We recognise the SNP’s desire to negotiate for continued use of Sterling in a common currency arrangement with the rest of the UK. While those arguing for a No vote will naturally express scepticism, we see no reason why a UK Government would not, in the full light of day after a Yes vote, be willing to make such arrangements. This might even be in Scotland’s interests… in the short term. However we remain clearly of the view that Scotland will only be able to exercise full economic independence if we stand ready to develop our own currency. The SNP Government may find itself playing a weak hand in negotiating the terms of a common currency arrangement if there is no plan B in readiness, and we therefore call on the Scottish Government, at the very least, to begin exploratory work to determine the steps which would be necessary for the development of a Scottish currency, in order that Scotland truly has the freedom to do so if and when it becomes an accepted necessity." So. 175 words. 5 sentences. Most of which are spent explaining why they disagree with the SNP's currency policy. They were happy to advocate a policy that would result in seismic economic upheaval on the basis of a few sentences. No analysis of how we would travel from A to B and the impact on ordinary individuals and the wider economy. Populists always recoil from the bothersome detail of implementation, as we have learned to our peril in the EUref. Let's not let them get away with it again should we find ourselves facing indyref2. Can anyone offer an absolute guarantee the Barnett formula, which applies to the majority of the Scottish Parliament's budget, is permanent if we stay in the UK? In the aftermath of the independence referendum the Barnett forumla got a stay of execution until 2020 as part of the Vow/Smith Commission. But Scottish Unionists are relying on future Conservative governments (assuming Labour don't provide an upset in 2020) extending Barnett's lifetime, despite widespread criticism from many MPs, parts of the media and some new Cabinet members. In the same way Nationalists based their economic case on the price of oil, Unionists should be wary they don't fall into the same trap with Barnett. No, it can't be guaranteed - nothing in life can - but it's there and was maintained as the vow said it would be. What about people hurting in other parts of the UK? Barnett is particularly unfair to Wales while England have had to watch deep cuts to public services, as Scotland remains relatively unscathed in comparison. Every extra billion that goes towards Scotland means less money spent in parts of the country. Scotland is one of the wealthier regions of the UK, there are parts of the North of England and Wales in a worse position than us. And our growing deficit means more borrowing, more money spent servicing the debt and less to spend on public services in the UK as a whole. That surely isn't a price worth paying just to make sure the Vow is delivered. If the UK was making a surplus every year then perhaps it could afford to carry Scotland but the fact is unless we get our own house in order, people in England and Wales are suffering by losing local services. Just crane your mane to the south and you can see the Four Unionist Rustlers of the Ajockalypse stampeding about. There's the Heedless Horsewoman astride a nag swinging her blunt but deadly scythe in mindless Mayhem. To her left atop a Trotting mule, with saddlebags stuffed with backstabbers, rides Tilting Corbyn Quixote.To her right, sitting backwards and wearing boxing gloves,Squire Ukip canters drunkenly aboard a gelded donkey. Taking up the rear, and almost lost to sight, come the FibDems at a gallop on a Shetland pony. 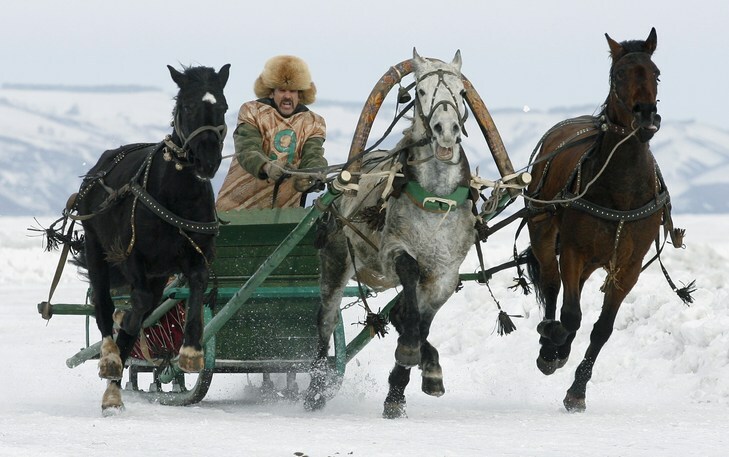 Now crane your mane to the north and see an unchained unicorn,clear eyed and resolute, pointing a sharp horn at the belly of this Distorted Dobbin on the make and move. The Scotland you and your schadenfreudian acolytes write and speak of is mythic. Kailyard - so no disagreement with any of the substantive points I've made then? good oh. This was one of the more sobering blogs I have read in some time. The shear awfulness of the SNP is sometimes difficult to believe but, there it is in black and white. My benchmark for judging the SNP is always New Zealand, a country that I know well and lived in for many years. It has a similar population size to Scotland, although some important differences. It shows that small independent countries can exist, although not at the same level of prosperity as Scotland. There are three points that strike me about Scottish government as practised by the SNP. First, and strikingly obvious, is the cult of the Dear Leader. The newspapers acquiesce in this with a range of stock Sturgeon photographs: Sturgeon pensive, Sturgeon aggressive, Sturgeon with international leaders, Sturgeon with children, etc. All carefully cultivated. Second, is the utter mediocrity of the SNP government and its administration, bordering in a number of areas on the incompetent. And the third, which is related to the other two, is the near invisibility of the Scottish Cabinet. Now, don't get me wrong. New Zealand has had its strong Prime Ministers, but even Sir Robert Muldoon in his prime, had to deal with a cabinet, and many of these people were extraordinarily gifted. A fair amount of legislation that was introduced in New Zealand over the past forty years has gone on to become international best practice, including Reserve Bank independence, transparent accounting of Government finances, Civil Service reform, etc. But, it comes at a price. New Zealand has just been ranked by the World Bank as second in the world as the country most easy to do business in, the same place as last year, and immediately behind Singapore. And if that isn't a clue, then it should be. Because if you're a Scot and don't much like the idea of Singaporean openness, then the chances are you won't much care for New Zealand. In New Zealand, you pay substantial fees to go to university. You pay to go to the doctor and the dentist. It is known as 'User Pays'. It doesn't apply to everything (surgery, for example), but it is an important mindset. Looking at Scotland under the SNP with a NZ lens, and one immediately wants to know why Scots are not paying for doctor's visits, or why tertiary education is free. This sort of thing is unaffordable, and grossly distorting economically. No wonder the NHS in Scotland, a wholly devolved responsibility, is such a mess when the SNP, like the Welsh Assembly, try and run it on less expenditure per capita than England. The difference and the Barnett top-up for health is spent instead on giving free university education to European students. This is not 'Stronger for Scotland', as the SNP would have us believe, but simple economic stupidity. Having a muppet like Robison as the Health Minister merely compounds the problem. I might add parenthetically that an independent Scotland will be quite unable to afford Universities with the world rankings that Edinburgh, Glasgow, etc. currently have. The highest New Zealand university is ranked only in the top 200. New Zealand did have its apocalyptic moment when the Muldoon Government fought the markets in 1984 and lost, ushering in the new economics. I was there, and the similarity between wholly insupportable economic policies then, and the SNP's policies now is very striking. I sense that Sturgeon and the SNP Government are approaching an economically cathartic end-game, in which the ridiculous freebies have to be abandoned to stop the Scottish NHS, for example, from imploding. But it will be a shock when it comes, and the SNP will probably be in ruins for some time. Independence will merely make things far worse. The SNP know this which is why they lie so much. I’m always cautious about economic predictions and doubly so during a period where we are undergoing the most revolutionary changes that have happened in my lifetime and where the government’s policies are largely unknown. The Fraser of Allander report on Brexit was very interesting. It showed that Brexit will hit England much harder than Scotland. In terms of deficit though it’s important to remember that the biggest tax payer (financial services) is not the biggest industry in terms of GDP. I could very easily see a hard Brexit disrupting the tax payments made by the City. Or looking at a single case in the car industry Nissan have been offered a subsidy roughly equal to 1p on income tax to cover their Brexit costs. 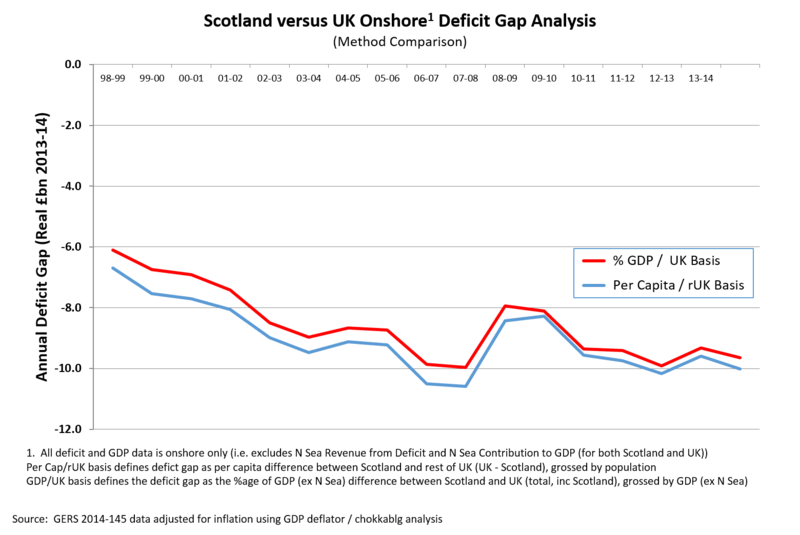 So it’s entirely possible that a Scotland’s deficit may end up better than the UK’s as a whole due to the English efforts to raise their deficit to our level. "...no disagreement with any of the substantive points ...made..."
Sorry for the tardy response but I've been "gone fishing"
I thought your "troika" intro was an invite for some levity.However..
How can I reply to there being anything substantive in your graphs etc. in regard to an Independent Scotland when it (your creative writing) is all a priori. You are talking only about a Scotland that is embedded in UK of GB and NI from the present. You,nor anyone else, has any direct experience of an Independent Scotland and any inter/intra dynamics regarding that construct and it's relations with any other future phenomena. You would be as well writing about the fiscal situation in Shangri-la or disclose a monetary inventory of the palatial furniture of Camelot. The worth of the smoky mirrors in the great hall perhaps. No, I can see all of it as nothing other than SNPBAD and a denigration of self determination. I'm off into the Kailyard for a fish BBQ. It's sunday and the Rules are fairly relaxed. You are firmly in the school of "we know nothing" - you resort to the approach that says our current economic activity is irrelevant, we should (apparently) assume independence will transform us into a high tax-generating economy because [except there is never any explanation of how or why or to what extent that could feasibly be true and over what timeframe this magical transformation might happen]. You eschew any discussion of our public spending (the healthcare, education, pensions, roads, policing etc. we're currently used to receiving) because to ask how we might sustain that (or if not what we might cut) is apparently futile because "none of us has any experience of an independent Scotland". You seem to disregard the power of mathematics. We don't know what the fiscal situation would be at the beginning of independence because it hasn't happened but we do know where we are now and we know the deficit. From that it's easy to calculate the likely deficits/surpluses from any growth and spend scenario. I've already done it so we can predict with great accuracy where we would be. You seem to think that Scotland under independence would find some hidden treasure that would solve all our problems. There's a good reason why the SNP has never ever ever issued financial figures for an independent Scotland. They know they're awful and so do we. Even if we could go independent with little negative consequences there's a time bomb waiting under the SNP. Any currency situation other than Sterling is likely to lead to colossal financial losses for Scotland and its people. That's why the SNP are so desperate to find the least bad option because they're all horrific. I suggest you do some calculations on the future numbers of a potential independent Scotland instead of gazing at the flag and dreaming of Mel Gibson. Hi Kailyard The difference between you and Kevin is that the latter at least bases his analysis on published data and statements. You do however make one point which is worth commenting. The start point of an iScot would have to be the fiscal flows which are known about and the institutions of government as they are now. Your point out that no one has knowledge of the post independence situation regarding flows. However it is possible to model this in detail. The current fiscal situation is known to some extent: - for example ScotGov expenditure and revenues are published. A spread of assumptions can be made about certain liabilities e.g state pensions share of debt. The set up costs of various institutions can be estimated e.g iScot DVLA, HMRC, Foreign embassies etc. Assumptions can be made running forward regarding economic performance and revenues. Tax and expenditure rates can be modeled. I remember watching Alec Salmond comment that iScot would require a couple of suitable naval vessels to protect Scotland and its Fisheries. Sitting next to me was someone involved in Naval Shipbuilding. His comment was there is a couple of £Bn and a few hundred million a year running costs. My point is this - I think it is worth doing a really comprehensive economic model of iScot with all the costs of set up and future government expenditure. On that you are right. There's not a no risk option available to Scotland in terms of our current deficit and fiscal position. There are many uncertainties with staying in the UK which might not on the face of it be as risky as independence but they are not without economic costs. Barnett is only gauranteed until 2020. The architects of the Vow no longer have any political influence in the UK. Scottish Unionists have a little over 3 years to convince the current UK Government that there is a sound case for Scotland enjoying much higher public spending than England and Wales. If Brexit has a negative effect on the UK's economic and fiscal position then it will be difficult for the UK Government to argue in favour of Scotland still getting preferential treatment over England and Wales, particularly now that we have more tax raising powers and with a General election looming in 2020. Barnett gives Scotland an additional 20% on average more in terms of public spending than England. Worst case scenario is that the Conservatives scrap Barnett and come up with a new funding arrangement where Scotland's public spending is brought into line with England. This could see between £1.5 and £2 billion pounds cut from our current budget. This could force the SNP to scrap free prescriptions (£900 million) tuition fees (£225 million) and free personal care for the elderly (£350 million). The alternative would be to raise taxes. ADP, Aggregates Levy and Stamp duty wouldn't really provide much additional income to fill that shortfall. That leaves us with income tax. A 1p raise in income tax brings in about £500 million so we would have to raise income tax by 3-4p to fill the gap. So while Nationalists currently don't have to face up to their own economic arguments being tested, it's time for a bit more honesty about the reality facing Unionists, who most likely will have to face up to the challenges we face. Drew that's an interesting post. I was not aware that Barnett was only guaranteed until 2020. The timing of this in the Westminster and Scottish election cycles would be interesting. Even with the uncertainty of a Brexit overlay re establishing Barnett in a new settlement would have to come to the table in ?2019?. A source of gigantic grievance creation and would enable SNP to pass blame for subsequent cuts onto their bogey 'Westmonster' to get through SGE2021. The Tories would have a solid argument to say the funding is being corrected to UK (English) norms and if SNP want to have a high tax high spend economy then they can do so. If at GE2020 the Tories have a Brexit deal and are are confident of a comfortable victory then they could well change Barnett in the teeth of the SNP outrage. For Barnett the Treasury issues a "statement of funding policy" document, all the info you will probably require. There will be an independent report put before both governments. So it isn't exactly clear how things will play out around the election periods. But Barnett was never meant as a proper and fair funding mechanism, it has always been political. Regions of England and Wales have been suffering economic decline for years, far greater than Scotland, but Barnett takes no account of that. Just like the Goschen formula in the 1880s was designed to give Ireland an over generous funding settlement to try and address Irish Nationalism. It is no coincidence the Barnett was created in the 1970s when the first North Sea oil boom gave Scottish Nationalism a huge boost. Giving Scotland an over generous funding settlement was a blow to Scottish Nationalists and helped ease anxieties of Scottish Unionists. It worked too, as the first campaign for a Scottish Assembley failed in 1979. However, now the immediate threat of independence is over following the No vote, the UK Government doesn't need to grant another referendum ever again, or at least for a few decades. The oil revenues have dried up and so the political need for Barnett has gone. I suspect the SNP will narrowly cling onto power in 2021, no matter how small and unpopular their minority government is by then. When Barnett is then scrapped in favour of a fairer settlement for England and Wales, Scotland will face billions of pounds in cuts to services or have to raise taxes dramatically. The Conservatives are probably calculating that a fairer funding settlement than Barnett will play very well with their core voters and swing voters in England and Wales. The SNP will be forced to abandon universal benefits that made them popular with the middle classes in Scotland and that or big tax hikes will kill them off as a political force. It won't be much fun for Scottish Unionists either because Barnett is one of their main arguments against independence. But for the Conservatives a bit of pain for Scotland is a price worth paying. The Barnett Formula wasn't created until the 1970s, but it was merely a continuation of the same funding levels that Scotland had been receiving for decades. The Goschen Proportions resulted in Scottish spending reaching 112% of the UK average by the late 20s. In the 50s, when Goschen was suspended, Scotland was receiving more than 120% of UK average spending, and that level was maintained until Barnett was put in place. Scotland’s expenditure relative increased to 126 in 1969-70 before falling to 117 in 1974-5, then falling again to 122 by 1977-8, and fluctuating around that level throughout the eighties (Midwinter 2000). The future of Barnett certainly isn't guaranteed, but Scotland has been receiving a similar level of funding for almost 90 years, and I can't see any major changes being implemented soon. That's a fair point, however, while previous funding models may not have been needs based as such, Scotland for the first 250 years in the Union certainly was desperately in need. Poverty, disease, low wages, poor housing conditions and unemployment meant for most of the 19th century and early 20th century Scotland lost between 10-40% of the natural population increase to emigration every decade. The gap between Scotland and England then in terms of personal wealth was far greater than it is now. Even as late as 1911, two-thirds of Scots were living in one- or two-roomed houses compared with only 7% in England. Poverty was widespread, wages were low in comparison with other parts of the UK and infant mortality rates were alarmingly high. The creation of the welfare state and NHS helped improve life and the collapse of the British Empire and process of decolonisation meant there were fewer job opportunities abroad for Scots and many returned or fewer left to go abroad in the first place. This meant our population began to stabalise and it was only in the 1990s that the numbers of people moving to Scotland began to outpace the numbers of people leaving. And the wealth gap between Scotland and most of the UK (London & South East aside) has more or less been reduced to on par. 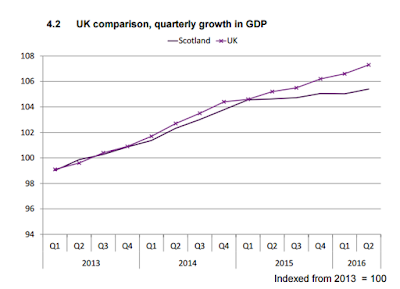 Leaving aside our poor fiscal performance which is largely as a result of over spending in Scotland, despite the oil price crash our overall economic performance isn't too bad at present. Because so much of the oil industry is so localised to Aberdeen and Aberdeenshire, we shouldn't see the type of impact on our cities, regions and towns as a whole as the collapse of mining, shipbuilding and heavy industry. Currently our unemployment rate fluctuates slightly below or above the UK average and our GDP per capita is more or less the same as the UK. Even without North Sea oil and gas, tax revenue in Scotland is still only just slightly less than the UK per person. According to our gross value added per capita, apart from London, the South East and the East of England, we are one of the wealthier parts of the UK. So there are no real reasons why we deserve special treatment over the poorer regions of England & Wales. Clearly what would be in the best interests of the UK as a whole would be a needs based system. On top of that devolution, 'one of the most powerful devolved parliaments in the world' apparently, means we now have tax raising powers to increase our revenue if we want to. If devolution to the cities and regions of England continues, those areas are quite rightly going to be asking for a more appropriate and fair funding system than Barnett. Anonymous - its only valid to deny the accuracy of GERS if you have a detailed reason based on verifiable facts. Would you mind forwarding me the source info for the photo at the top of this blog? I am working on a Troika image project and would like to obtain rights for use.